Said to have the mildest climate in Britain, the village of Flushing (photograph below) owes its name to its Dutch founders and its narrow streets still retain a distinctly Dutch flavour, as well as several Queen Anne houses. 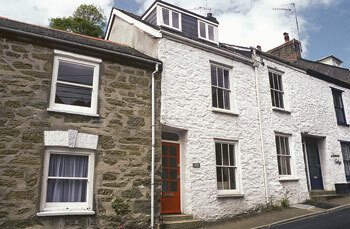 One of a row this simply furnished cottage is just a minute's walk from the pub and shop and ½ mile to the beach. 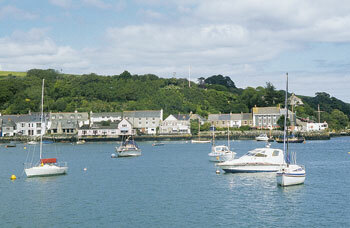 A ferry crosses the river to Falmouth with its sandy beach, shops, restaurants, new Maritime Museum, and cruises up river to the city of Truro (9 miles by car). Sailing school 2 miles. Famous gardens along Helford river nearby. Three bedrooms. Open plan sitting/dining room with kitchen area, and rear door to small courtyard. First floor: Double bedroom. Single bedroom. Bathroom/W.C. Stairs to loft: Twin bedded room with sloping ceilings and additional single bed (for + child).